Asian Games flyweight gold medalist Rey Saludar and younger brother and light flyweight bronze medalist Victorio will lead the Philippine team that leaves on Saturday to compete in the China Open boxing tournament in Guiyang. Also in the squad will be featherweight Ricky Dulay and brothers Orlando Tacuyan (lightweight) and Rolando Tacuyan (light welterweight) as well as lone female boxer Annalisa Cruz. Amateur Boxing Association of the Philippines executive director Ed Picson who heads the delegation said strength and conditioning coach Pio Solon who has been working with the top pro boxers of the ALA Gym including Rey “Boom Boom” Bautista, AJ “Bazooka” Banal, Donnie Nietes, OPBF flyweight champion Rocky Fuentes among others has been helping the amateur hopefuls since last February. Solon said there are several medal potentials in the national pool including two female boxers aside from the Saludar brothers, multi titled Charlie Suarez and a recent winner of the gold medal in the tough Sydney Jackson Memorial tournament in Uzbekistan, 17 year old light flyweight Mark Anthony Barriga. Both Solon and Picson lamented the fact that Gerson Nietes was injured because they believe he is loaded with potential. This was confirmed by Glen Donaire, elder brother of WBC/WBO champion Glen Donaire when he sparred with Nietes during a national team stint in California. 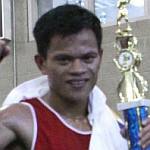 Donaire said Nietes was a good boxer with a solid punch. Solon, ntalking about the fibhters training said there was “one really positive note and that was the ABAP is working with a very good sports psychologist who handles the Far Eastern University basketball team.” He identified the psychologist as Lee Tajonera. Picson too was impressed and said Tajonera who graduated with a general psychology degree from Ateneo and also studied at a university in San Diego, California had started working with the ABAP on Monday. The Philippine boxing team to the China Open is also boosted by the inclusion of Wilfredo Lopez according to Ed Picson, executive director of the Amateur Boxing Association of the Philippines and delegation head. The coaches accompanying the squad will be former 1992 Barcelona Olympic Games bronze medalist Roel Velasco who lost in the semi finals to Cuba’s eventual gold medalist Rogelio Marcelo and multi-titled Ronald Chavez.